For more than a thousand years Our Lady’s cathedral at Chartres has stood in grand gothic testimony to the faith of our fathers and the Christian cult of the Blessed Virgin Mary. Before Chartres, Christian churches were typically dedicated to the saints whose relics they were built to house. Chartres is different, for it is one of the first dedicated solely to the Mother of God. She so stirred the medieval soul that nearly all cathedrals that came after Chartres were dedicated to Our Lady—Notre Dame—the Virgin Mother of God. In a very real sense, then, the master builders of Chartres pioneered the cult of the Blessed Virgin Mary that would come to dominate Christian Europe for a millennium. And Chartres became the fourth most popular pilgrimage destination on earth because of a simple piece of silk cloth worn by a young Jewess from Nazareth when Caesar still ruled the world. Her name was Mary, and her veil is the raison d’être of Notre-Dame de Chartres. One of the most important relics of Christendom, tradition tells us that it adorned the Virgin’s head when Gabriel announced the Incarnation. According to Blessed Ann Catherine Emmerich, Mary also placed this same veil over her crucified Son's nakedness when He was taken down from the Cross. It was discovered by St. Helena, along with the True Cross, in the year 326, who presented it to her son, the Emperor Constantine. Later on, the Empress Irene gave it to Charlemagne’s grandson, Charles the Bald, who donated it to Chartres in the year 876 AD where it remained for the next 1100 years. With the veil’s fabric tested by scientists in modern times and its movement meticulously tracked by historians down through the ages, there can be little doubt as to its authenticity. Chartres’s crypt—the first cathedral- was expanded specifically as a reliquary for the veil of the Mother of God. But atypically, there are no graves in that crypt—no tombs, no remains of the dead. Rather it has always been a place for the living, specially reserved for Mary to come and go as she pleased. The great gothic jewel was built by the sons of Clovis as a “play house” for their mother. And pilgrims for a thousand years have walked to Chartres to venerate the veil in which it is said that Mary wrapped the Savior of the World in Bethlehem. Although the first cathedral was destroyed by fire in 1194, Notre-Dame de Chartres, as it stands today, was quickly rebuilt by Catholics who carried their cathedral on their backs, one block at a time, from a nearby quarry, and then dedicated the rest of their lives to fashioning them into a castle fit for their heavenly queen. Today the cathedral at Chartres stands as the greatest monument to Christian faith ever built by human hands. She has been called the “Bible of the poor” because her stained glass, sculptures, and architecture, educated pilgrims for a thousand years. From crypt to nave to contrasting spires three stories high, Chartres tells the story of salvation from the Garden of Eden to the Resurrection of Christ. Her 150 13th-century windows document salvation history from the dawn of time. And while Christians in medieval times may have been illiterate, they were well versed in the rich symbolism of the windows of Chartres. Like a mother teaching her children, Notre-Dame de Chartres spent centuries silently catechizing our forefathers in the Catholic Faith. There are layers upon layers of symbolism everywhere one looks in Chartres, even in her stone floor which incorporates a labyrinth representing man's earthly journey from darkness to light. As they walk the labyrinth's path, pilgrims must make repeated changes in orientation away from Satan and towards the heavenly Jerusalem. And the precision of the Christian architects was such that, were the facade to be lowered to the floor, Chartres’s famous North Rose window would come to rest precisely over the labyrinth. The great twentieth-century French poet and convert to Catholicism, Charles Peguy, made a journey along the labyrinth on his knees after one of his pilgrimages to Chartres. And this year, Remnant pilgrims were privileged to walk that same labyrinth at 6:30 on Pentecost Wednesday morning, while the cathedral was closed to visitors— moving from darkness to light, just as he had. And just before midnight the night before, the Remnant pilgrims descended by candlelight into Chartres's ancient crypt, retracing the footsteps of their medieval pilgrim counterparts. Just as the pilgrims of old had done a thousand years ago, we brought light down into the darkness, becoming human metaphors of the lumen Christi. Standing in the murky midnight of the crypt, flanked by faded murals of St. John, St. Mary, and the apostles, painted a millennium ago by unknown hands, animated anew by the flickering candlelight, our hearts beat in unison with those of our departed fathers. We could sense they were near, moving from the darkness into the light along with us, especially when we raised our voices in the same song they’d sung on their arrival to this holy place, centuries ago— Salve, Regina, Mater misericordiæ, vita, dulcedo, et spes nostra, salve. How does one describe such a tangible connection with Christians a thousand years dead—men and women who would have leaned against this same pillar, touched that same stone, knelt before the same veil, and made silent appeal to the same Virgin Mother. Tears burned in my eyes, standing there in the stone silence, candle in hand— tears of joy, not over my belief that all of this is truly how it was, but rather over the certain knowledge that it was... and it is. The Christian reality is carved so deep into the stones of Chartres that here faith is hardly required. Kneeling before the actual veil of the Virgin, the pilgrim suddenlyknows that which only a few days earlier he’d merely believed. Yes, Salve, Regina! You are here with us. Let us stay with you a while longer. We have no desire to leave your house. Chez nous! This year’s Notre-Dame de Chrétiente Pentecost Pilgrimage to Chartres concluded Pentecost Monday, May 21, with a magnificent Pontifical High Mass offered by His Eminence Cardinal Robert Sarah, prefect of the Congregation for Divine Worship and the Discipline of the Sacraments. His Eminence delivered a sermon for the ages that must have given even the old stones reason to smile. He challenged young Catholics the world over to do as their fathers had done—to stand and resist the culture of death and to risk martyrdom rather than abandon Christ the King and the sacred traditions of the Catholic Church. He was calling a new Christian crusade. And as I listened to him speak, it became clear to me that this battle for the old Faith is far from over. For 27 years I’ve walked this pilgrimage, and every year it grows larger, stronger and more impossible for the world to ignore. The average age of the Chartres pilgrim now is just 20 years old—and thousands of them stood witness to the return of the Traditional Latin Mass, the glory of all Christendom. Nearly a half-century ago, the first pilgrims to Chartres in the modern era were not even allowed into the Cathedral, but were instead obliged to offer the Traditional Latin Mass outside the locked doors of Notre-Dame de Chartres. This year, Cardinal Sarah offered the “abrogated” Traditional Latin Mass of the Ages to God and for the benefit of well over 15,000 pilgrims, hundreds of young priests, abbots, sisters, politicians and even the newly-installed bishop of Chartres— Mgr Philippe Christory, who seemed genuinely moved by the grand Catholic spectacle playing out before his eyes. And why not, when he himself had so recently walked the road to Chartres, as well. 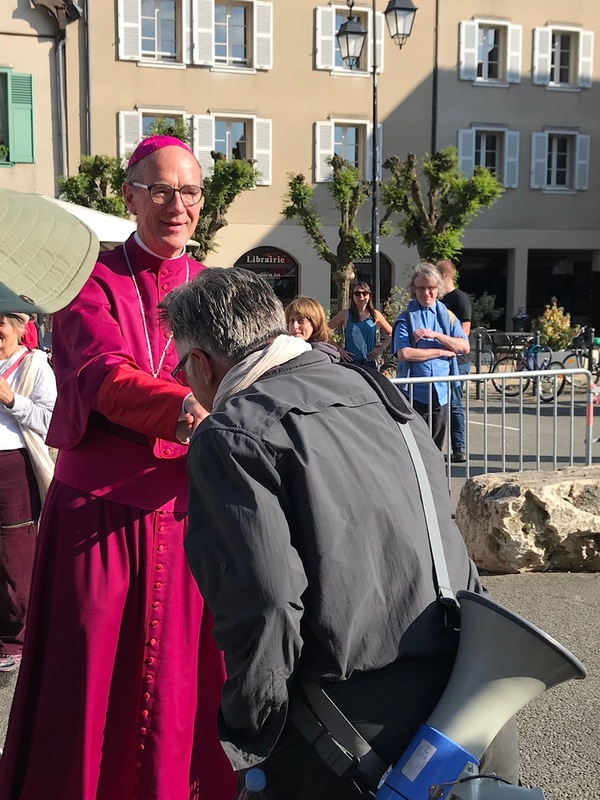 When Archbishop Christory— the 129th bishop of Chartres—was appointed to his new see just two months ago, he’d insisted on going from Paris to Chartres as a pilgrim…on foot. For five days, the new bishop walked the road to Chartres. And now here he was, assisting at the Traditional Latin Mass offered by Cardinal Sarah—a man some say could be the next pope. Qui sourit et pardonne, chez nous, chez nous. Who smiles and forgives, in our home, in our home. This they sang with all their hearts, as they carried their banners out into the city of Chartres. Again, my vision blurred as I fought back the tears that always seem to come at Chartres. To be with her…that’s why we all go back to Chartres each year—to become Mary’s children again, to place our trust in her intercession, even when hope seems to be fading from the face of the earth. There she is—our regal mother— triumphantly waiting for us at Chartres, proving to us again that, in the end, her immaculate heart will indeed triumph and despair has no place in our hearts. And now it’s back to the front—the blisters, rocky ground, damp sleeping bags, meager soup, hard bread, troops of scouts and endless walking having once again become the happy memories of the grand Catholic adventure that is the Pilgrimage to Chartres. God willing, The Remnant will for the 28th time return to Chartres in 2019 to organize the U.S. Chapter. We will also make a post-Chartres pilgrimage to what was once the seat of the Holy Roman Empire. Visiting Vienna and Budapest, we’ll also spend a night at Zell, which is nestled in the midst of the Styrian Mountains 50 miles southwest of Vienna. This ‘Lourdes of central Europe’ is the most popular Marian shrine in Austria—Our Lady of Zell, which in 1907 was made a Minor Basilica by Pope Saint Pius X, who also crowned the miraculous statue that same year. If you’d like to join us, registration opens on July 15. Thanks once again to our French allies who organized what is without question the most important annual Catholic event happening anywhere in the world today. After all these years, the French traditionalists are indeed our brothers, and for us it is an honor to accompany them on their pilgrimage to venerate Mary's veil and to bring the Latin Mass back to Chartres. Many thanks to readers of The Remnant who sponsored so many young American pilgrims. Your sacrifice was not in vain, as the U.S. chapter was comprised of truly upstanding traditional Catholic young men and women with whom I was proud to walk to Chartres. I’m still filled with hope for the future, in fact, having spent 12 days with the young Catholics you so generously sponsored—young Catholics who are preparing to make your Catholic cause their own. My son, Walter, 20 years old, who has walked the Chartres Pilgrimage at my side for the last five years, has for the past two years headed up what our French friends have good-naturedly christened the “U.S. Rangers”—a team of American tent builders who volunteer to help Notre-Dame de Chretiente build the many tents needed to accommodate well over 10,000 pilgrims during the two nights on the road to Chartres. Walter is looking for young people willing to assist him, but also willing to forego most of the walking in order to assemble, disassemble and then reassemble the pilgrim tents. We’ll be offering a $1000 discount per volunteer, so please contact Walter Matt if you’re interested: The Remnant Tours: PO Box 1117, Forest Lake, MN 55025. A word of thanks to our indefatigable chaplain, Father Gregory Pendergraft, FSSP, for his tireless devotion to this project and to ministering to the spiritual needs of Remnant pilgrims. Father has been with us for more than five years, and has agreed to join us again next year. Father Pendergraft walks every step of the road to Chartres, and provides an excellent priestly example to the young pilgrims. He is a young priest of the old school, and we thank God for him. And finally, just a word of thanks to all those who walked to Chartres under the banner of Our Lady of Guadalupe. For me, personally, it was an honor to be “in the trenches” with you all. Thanks for being with us, thanks for your patience, and I hope to see all or some of you again on the road to Chartres.